Ladybugs stand for luck so why not start your day off surrounded by the symbol of luck? On the top part of the design our little ladybugs are surrounded by coordinating black and red hearts. As if the ladybugs weren't sweet enough we added a touch of nostalgia by including the all American red and white gingham pattern to the bottom of this wonderful and warm design. A wide band of red with an inset of black trim pulls the design together. 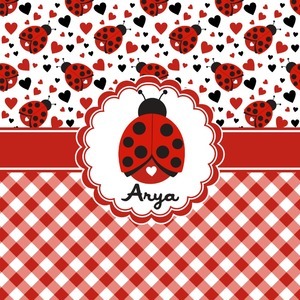 A cute ladybug sits in the middle of a white scalloped circle label that is trimmed in double rows of red. Under the ladybug is ample room for custom personalization.